New simulations reveal that proto-galaxies may work together to create hefty direct-collapse black holes. Black holes weighing 1 billion suns dot the very early universe. How they grew to be so big less than a billion years after the Big Bang has puzzled astronomers because that doesn’t seem like enough time to build up so much bulk. Now, simulations by researchers at the Flatiron Institute’s Center for Computational Astrophysics (CCA) suggest that galaxies that developed at the dawn of the universe might have worked together to breed such behemoths. The dependence of one galaxy on another for black hole formation is very surprising, says Greg Bryan, a professor of astronomy at Columbia University and leader of the galaxy formation group at CCA. Along with John Regan of Dublin City University, CCA research fellow Eli Visbal, and colleagues, Bryan used state-of-the-art computer simulations to show how a galaxy that has just collapsed and started forming stars can irradiate a galactic partner nearby so that some of the partner galaxy’s gas collapses into a black hole. Such direct-collapse black holes, weighing 100,000 to 1 million suns, could then act as “seeds” for supermassive black holes weighing 1 million to 1 billion suns. The team describes the result in a paper published online on March 13 in Nature Astronomy. The simulations provide a “nice, new idea” for explaining how direct-collapse black holes might have been generated, says Volker Bromm, a professor of astronomy at the University of Texas at Austin who was not involved in the study. Bromm and his colleagues first proposed the idea that a huge cloud of gas could collapse directly into a black hole in 2003. In this scenario, all the gas in a developing galaxy would be bathed in intense radiation that would prevent star formation and keep the gas in the galaxy just hot enough to make some of it collapse into a black hole. But the amount of radiation needed to make the scenario work was extremely high, and astrophysicists had to fine-tune other parameters of the scenario, too, making the solution feel unsatisfying. The “idea of a twin system, where two clouds collapse at about the same time, takes away that problem,” Bromm says. The new simulations by Bryan, Visbal and their colleagues show how such a twin system would work. The team estimates that a background level of radiation, supplied by other galaxies, could delay gas in a galaxy (call it galaxy A) from fragmenting quickly into smaller clouds that would form stars. But the background radiation alone would not be enough to let the gas collapse directly into a black hole, the team notes. Hydrogen atoms would eventually bond, and the formation of molecular hydrogen would cool the developing galaxy’s gas, spurring star formation. So something else would have to break the galaxy’s molecular hydrogen apart to keep stars from forming. That something else, the simulations show, is a burst of new stars in a galaxy nearby (galaxy B). Such a burst would be the final push that the galaxy A would need to collapse completely into a black hole, Visbal says. The new stars forming in the first galaxy B would send radiation into galaxy A, destroying molecular hydrogen there and suppressing star formation. As a result, some of the gas (about 100,000 to 1 million solar masses) would be free to collapse and form a black hole. The simulations, based on laws of physics and basic chemistry, do not quite get down to the scale of the black hole itself, but they do confirm that gas would not fragment or form stars in the galaxy that directly collapses into a black hole, Bryan says. One way to test the idea would be to study the light from a developing galaxy where a direct-collapse black hole might have formed. The chemical signatures in the gas would reveal that the light is being emitted from the accretion of matter onto a black hole, not from star formation. Tantalizing clues lie in recent observations of a galaxy called CR7. Seen as it was when the universe was less than 1 billion years old, CR7 emits a lot of ultraviolet radiation but may not have formed any stars, which suggests that a direct-collapse black hole may sit at the galaxy’s center. 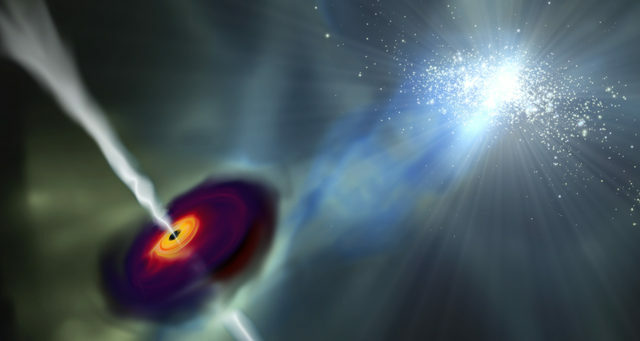 Future observations confirming the claim could fill a major gap in black hole science.